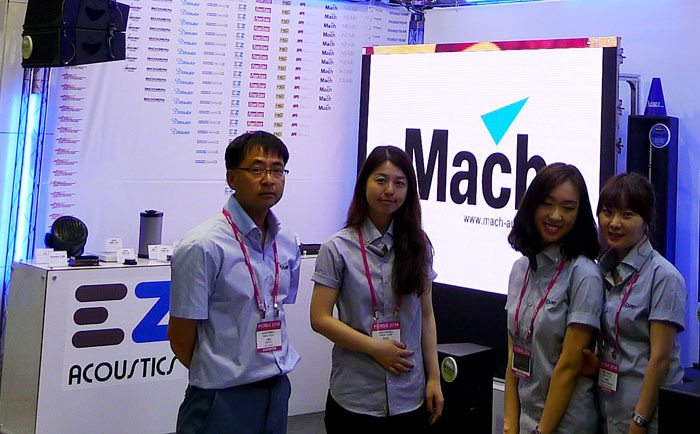 Media House at Korea Internation KOBA 2014 with Mach speaker. KOBA exhibition will exhibits excellent international broadcast, video, audio, lighting equipment and detailed technical information. MEDIA HOUSE Inc. has not only distributed best quality sound equipment in Korea from major companies throughout the world but dealt, designed and installed sound systems. And also it has taught up-to-date sound technologies and played comprehensive roles in musical instrument, sound and multimedia facilities all over Korea. With quick acquiring the latest technologies and collecting information, MEDIA HOUSE Inc has been leading domestic distribution of general sound and multimedia devices. It has various experience in designing and installing sound systems for broadcasting companies, recording studios, concert halls, theme parks, religious facilities, schools, government and public offices. To maintain its credit and fame in sound and multimedia market, all MEDIA HOUSE personnel is always ready to serve you with rapidity and kindness.